Cowles Library is the largest private academic library in Iowa. Our purpose is to support the educational goals of Drake University by providing services, collections, technology, and learning opportunities that make it possible for faculty and students to successfully access and use information. Find out more about the Library’s mission, strategic programs, and assessment activities at Our Purpose, Our People. Discover our unique University Archives, special collections, and Heritage collections at Drake Collections. We are also a selective Federal Depository Library for government documents, and the building is open to the general public during regular building hours. A dedicated computer for electronic government publications is available for public use. 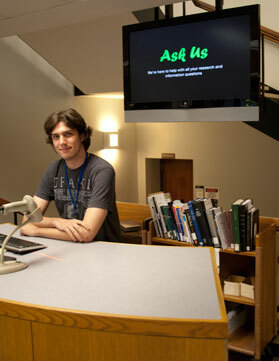 Reference librarians are available to help during reference desk hours. Complete list of regular and special hours for the current semester. Faculty and staff of the Library. Other directories include subject specialists and your department’s faculty library liaison. After Hours Study offers Drake students a high-quality study space outside of regular library hours. Cowles Library is a popular meeting spot for student organization and campus groups. The basic rules of how the Library works. How to find us, how to get in touch.